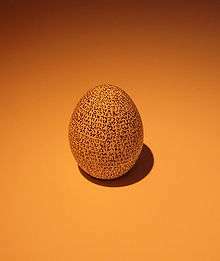 The first chapter of Genesis (B'reshit in Hebrew) written on an egg in the Israel Museum. Genesis 1:1 is the first verse of the first chapter in the Book of Genesis in the Bible and forms the opening of the Genesis creation narrative. Transliterated: Bereshit bara Elohim et hashamayim ve'et ha'aretz. -it ית‎, a grammatical marker implying "of". The definite article (i.e., the Hebrew equivalent of "the") is missing, but implied. The complete word literally means "at [the] head [of]", or more colloquially, "in [the] beginning [of]". The same construction is found elsewhere in the Hebrew bible, usually dealing with the beginning of a reign. bara ("([he] created/creating") The second word is the Hebrew verb bara (ברא‎). It is in the masculine form, so that "he" is implied. (English verbs do not distinguish between he, she, and it.) A peculiarity of this verb is that it is always used with God as its subject, meaning that only God can "bara"; it is the characteristic verb for God's creative activity in Genesis 1. "Bara" is also used in Genesis 2 verses 3 and 4. The meaning of "bara" is not "create" in the modern sense, but to differentiate/separate and to allocate roles - e.g., in the creation of Adam and Eve, God allocates gender roles to "male and female". elohim ("God") Elohim (אלהים‎) is the generic word for God, whether the God of Israel or the gods of other nations. It is used throughout Genesis 1, and contrasts with the phrase Elohim YHWH, "God YHWH", introduced in Genesis 2.
et hashamayim ve'et ha'aretz ("the heavens and the earth") Et (אֵת‎) is a particle used in front of the direct object of a verb; in this case, it indicates that "the heavens and the earth" is what is being created. The word ha preceding shamayim (heavens) and aretz (earth) is the definite article, equivalent to the English word "the". Shamayim has the dual -ayim ending, indicating that the word is "heavens" rather than "heaven". The Opening of Genesis Chapter 1 from a 1620-21 King James Bible in black letter type. 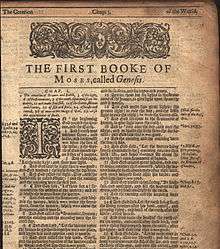 The first edition of the KJV was 1611. As a statement that the cosmos had an absolute beginning (In the beginning God created the heavens and the earth). As a statement describing the condition of the world when God began creating (When in the beginning God created the heavens and the earth, the earth was untamed and shapeless). Taking all of Genesis 1:2 as background information (When in the beginning God created the heavens and the earth, the earth being untamed and shapeless, God said, Let there be light!). The idea that God created the universe out of nothing (creatio ex nihilo) has become central to Judaism, Christianity and Islam, but it is not found directly in Genesis, nor in the entire Hebrew Bible, and is not the preferred option. The Priestly authors of Genesis 1, writing around 500-400 BCE, had been concerned not with the origins of matter (the material which God formed into the habitable cosmos), but with the fixing of destinies. This was still the situation in the early 2nd century CE, although early Christian scholars were beginning to see a tension between the idea of world-formation and the omnipotence of God. By the beginning of the 3rd century this tension was resolved, world-formation was overcome, and creation ex nihilo had become a fundamental tenet of Christian theology. ↑ Blenkinsopp 2011, p. 3-31. 1 2 Walton 2006, p. 183. ↑ Bandstra 1999, p. 38-39. ↑ Nebe 2002, p. 119. ↑ Blenkinsopp 2011, p. 30. ↑ May 2004, p. 179. Bandstra, Barry L. (1999). Reading the Old Testament: An Introduction to the Hebrew Bible. Wadsworth Publishing Company. Bandstra, Barry L. (2008). Genesis 1-11: A Handbook on the Hebrew Text. Baylor University Press. Knight, Douglas A (1990). "Cosmology". In Watson E. Mills (General Editor). Mercer Dictionary of the Bible. Mercer University Press. ISBN 0-86554-402-6. May, Gerhard (2004). Creatio ex nihilo. T&T Clarke International. Wenham, Gordon (2003). Exploring the Old Testament: A Guide to the Pentateuch. Exploring the Bible Series. 1. IVP Academic. p. 223. "Genesis 1:1." Online Parallel Bible.